It’s nice to see art in a great museum: hushed galleries, perfect lighting, small schoolchildren sitting cross-legged and sketching. It’s a knockout lifetime experience to stay in a hotel with great art—to see a Magritte from your shower, or hard-to-find masterworks of American photography on your way back from a beach cabana. Here, a tour of three independent hotels where you can pretend you’re Sir John Soane (minus the gloomy London weather). Part of The James Collection (Denihan Hotels), The James Royal Palm worked closely with Miami’s art world when restoring the Art Deco Royal Palm Hotel. The result: an inspiring contemporary collection offering different takes on the theme of The Bather in every guest room, sculpture installations, specially commissioned symphony performances, and interactive art games. The contemporary photography is especially strong. Former New York Times photographer Vincent LaForet‘s beach scene works both as abstract forms on a canvas-like background, and as a beautifully evocative image of a long sunny day at the beach. Slim Aarons, a collector’s darling famous for photographing the Beautiful People of the 1950s and ’60s, took this photograph of a family setting sail in a cherry red amphibious car. The work is perfectly set off by the haute beach bum air of The James Royal Palm and its South Beach surroundings. A stone mansion with 6 rooms, each different, Stonehurst Place is home to the very personal, excellent art collection of owner Barb Shadomy. Picassos, Warhols, a Magritte, and works by contemporary stars are tucked under the eaves and above the sideboards, to take in at your own pace as the day unfolds. 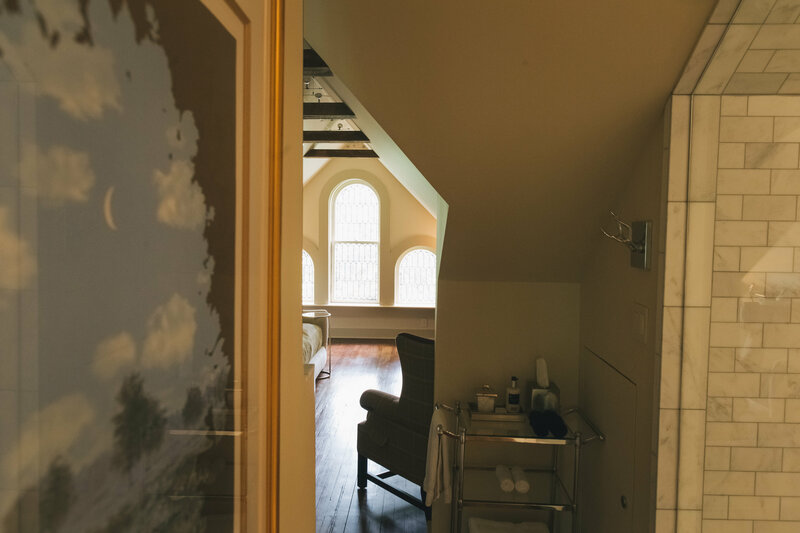 Reserve The Eaves suite to spy a cloudy Magritte through clouds of steam from your morning shower. Look above the sideboard to find two of Andy Warhol’s fairies from his 1956 series In the Bottom of My Garden). Warhol’s fairy series is frankly naughty: “These are about the only two I could put on display,” said Barb. Both are signed, whether by Warhol himself or his mother—whom he often enlisted to add signatures to his works—isn’t known. Above the pearl white settee in the living room: Christo’s never realized proposal for wrapping a frieze from the Parthenon at the Glyptotek in Munich. The treasure hunt continues, with more Warhols, a Picasso etching of a Centaur, and works by Candid Hoëfer, Lucy Williams, William Wegman, Wendy MacNaughton, and more. Meadows, forest, and creeks form an outdoor art park for witty installations by contemporary Northwest artists. Ask for the art map at the front desk and head out for a walk. Look up: Tony Angell’s bronze crows perch in the trees. Along the banks of Icicle Creek you’ll see a fountain of glass spikes rising up over the water like a fantastic Dr. Suess hair-do: this is Icicles, Dale Chihuly’s first outdoor installation. There’s far more: each collection is worthy of a big, glossy book, or, better, a visit: that way you get art, and those little magic Stash points that add up before you know it to more free nights in great independent hotels like these. You’re right! We’ve made the correction. Thank you for your expertise!